light source for a brilliant display. 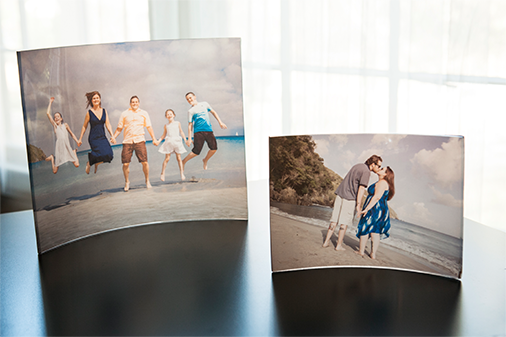 Beautiful and modern, curved acrylic prints really add to a display and light up your memories. Our new Curved Acrylic Prints are the latest in instant gifts from myphotopipe.com. These fun, self-standing prints show off your image from both sides and look even better when displayed near a light source! Easy to order, easier to give, Curved Acrylic Prints are an amazing way to display your favorite memories. What is the turnaround time for Curved Acrylic Prints? Curved Acrylic Prints have a four business day turnaround time based on a 9 AM receipt time in the lab. Can I order a vertical 5×7 or 11×14? No, these two sizes are only available using a horizontal image. What file format for the photo is required for the Curved Acrylic Prints? We prefer JPEG files and recommend a file with a minimum pixel size of 3000. Can I hang my Curved Acrylic Print on the wall? No, this product is not intended for hanging as it is curved and looks best when illuminated from behind. While the image can still be seen without illumination, the image benefits most from having a light source behind it. We do not offer hanging solutions for these Curved Acrylic Prints.